Bands across the water, bands across the world. My band and I had an amazing experience this week. 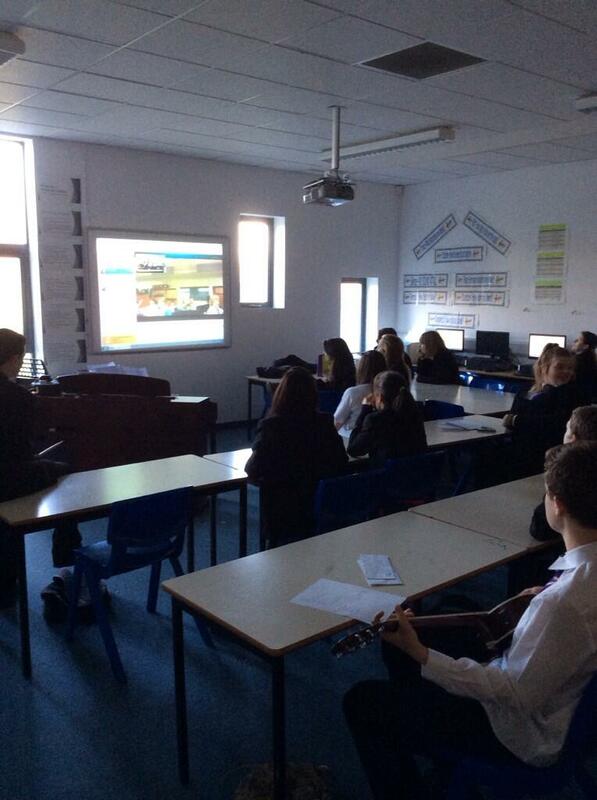 Using Skype, we created a concert with a group of Year 10 (Grade 9) students in Durham, U.K. We’re in Peterborough, Ontario, Canada by the way, where it was a frosty -15 Celsius, as my hardy band members made their way through the snow to an early morning practice. So how did this happen, and what are the takeaways? In very short order, we determined that our students were fairly close in age (mine are Grade 7 and 8), and that, amazingly, despite a 5 hour difference, the times would work out, if my kids came in for a practice early. We settled on a date, and I found that having some build up time gave me a chance to get my students excited about the event (and talk them out of building a backdrop with an igloo). So, 8:15 on December 17, with a few sleepyheads still setting up instruments, we were good to go – first a little trouble with sound, but quickly resolved, and then we were off…..and running! 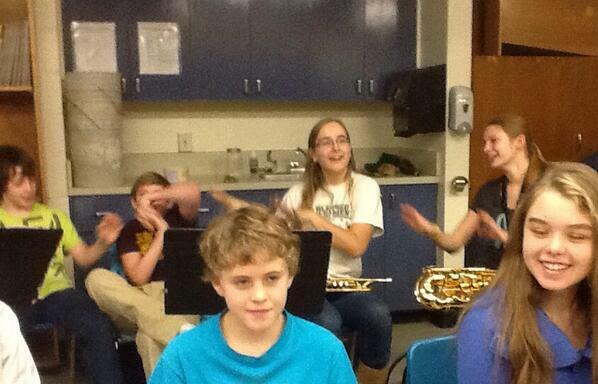 We played the 4 songs we’d prepared for our holiday concert that night, with students doing introductions. The pride on my students’ faces when the UK kids applauded was such a gift. Kids their age, an ocean away, were appreciating what they were doing. Then the Durham kids performed for us – individual pieces – vocal, guitar, piano. They needed to perform as part of their curriculum expectations, and we provided a unique, and enthusiastic audience. My students were totally intrigued by the information that one of the guitarists had written his own piece, and recorded it as part of an album that he had produced as part of his course work. As our time came to an end, both groups wanted to ask questions – about accents, and weather, and how old we all were – the usual things kids want to ask, no matter what age they are or where they’re from. I couldn’t help thinking about the we can see project as I held my webcam up to the window to show the snowy day we were having, and they showed us their still-green trees! My kids were horrified to find out that the British students thought they sounded like Justin Bieber, and the UK kids thought it was wonderful that they were horrified. We discovered that the consensus was that the 3rd Austin Powers’ movie is the best one. We even had a little showboating, as one of my very talented piano players couldn’t resist the chance to show that we had individual talents as well. What did we need to make it happen? Serendipity in finding the tweet, bravery in giving it a shot, a couple of computers and presto! 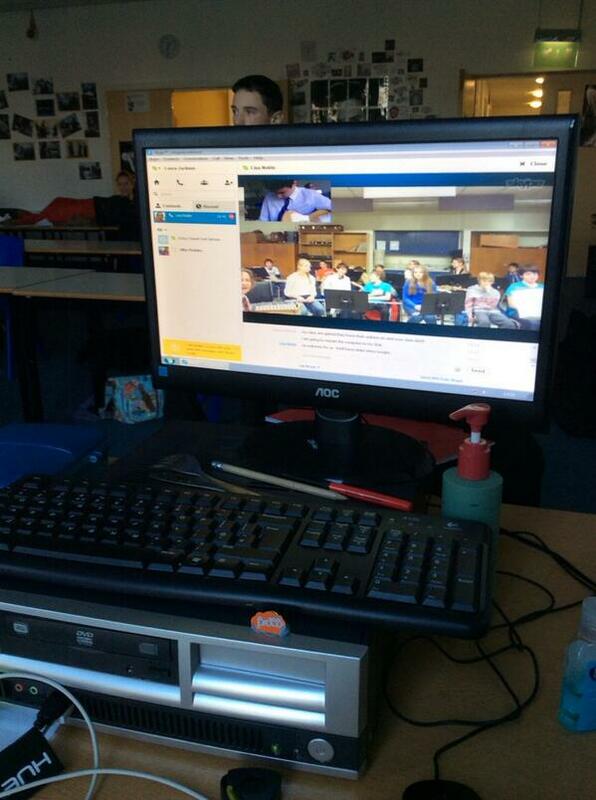 So, please, if you’re hovering on the edge of trying a #mysteryskype, or a #globalclassroom activity, take that leap. You’ll have a glow on all day, your students will want more, and you’ll have forever made the world a tiny bit smaller. This entry was posted in Uncategorized and tagged educational technology, global classroom, learning, music, Skype. Bookmark the permalink. Lisa, I somehow missed the fact that you’ve started blogging, and I just love your new blog. 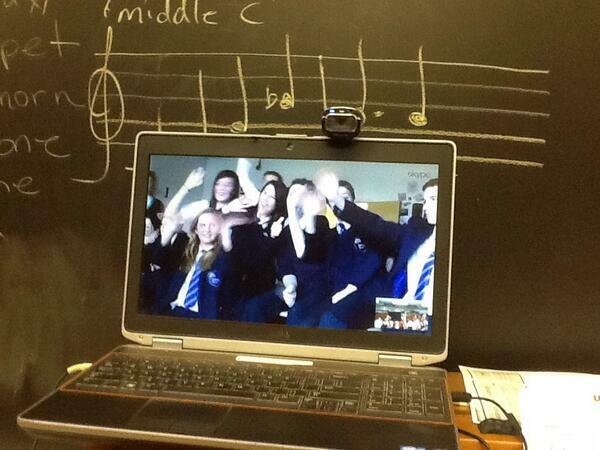 Hearing about your Skype concert is amazing. I plan on sharing this experience with the music teachers at my school. They may be interested in trying something like this out too. What a great way to make the learning come alive and give an authentic audience to your students. This is surely an experience that they’ll never forget! Thanks so much. I had done some blogging throughout #etmooc, and with PLP’s Voices but decided it was time to commit to my own space. The experience last week was awesome. We just had one of the parents of the UK kids get involved in the learning, because he saw the tweets about it, and asked his 15 year old son about it. Kind of cool to think that we’re helping increase parent-teenager communication, too. Hope your music teachers find it helpful. Thanks for the response, Laura. I couldn’t have done it without you. I’ll give the kids the heads-up about thinking about talent show ideas.